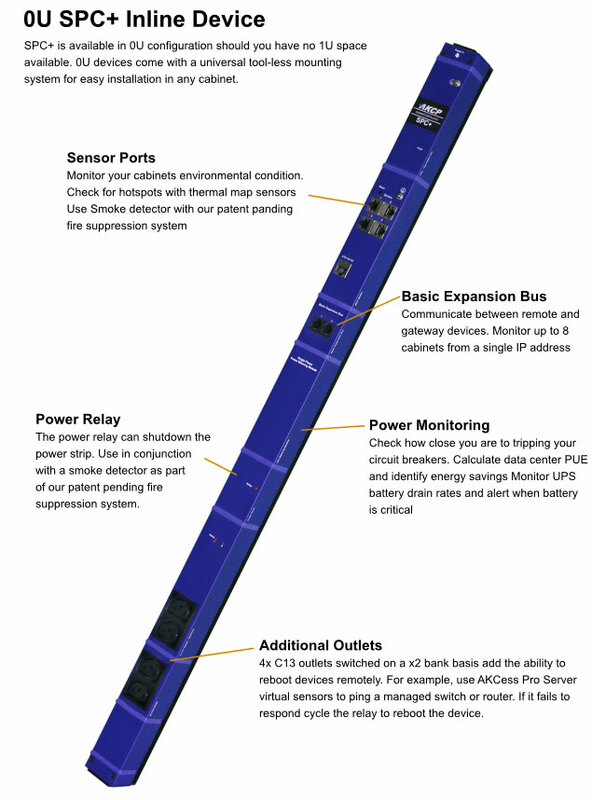 Product information "AKCP Smart Power Strip (SPC+)"
SPC+ adds power meters, relays, sensors, fire suppression and UPS battery management to your power strip. 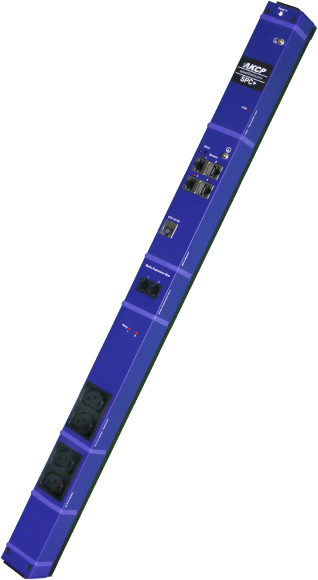 Install as either inline with your existing power strip, or with AKCP PS+ units. Monitor up to 8 cabinets. With SPC+ you can avoid downtime. Alerts notify you when power consumption is near critical levels. With SPC+ and AKCess Pro virtual sensors, PUE numbers are accurate and up to date. Make changes in your data center and see the immediate effect on your PUE numbers. When main AC power goes down SPC+ monitors your IT load consumption and calculates UPS battery time remaining. Be alerted when battery levels are critical and automatically shut down non-essential load. Shutdown a single cabinet in the event of a fire, avoid releasing potentially fatal gasses into your data center. Containing the situation to a single cabinet saves time and money. Check for cabinet hot spots with the 4 in 1 thermal map sensor. Monitor temperature at the top, middle and bottom of your cabinet as well as humidity. Adjust your cooling safely while maximizing your PUE. 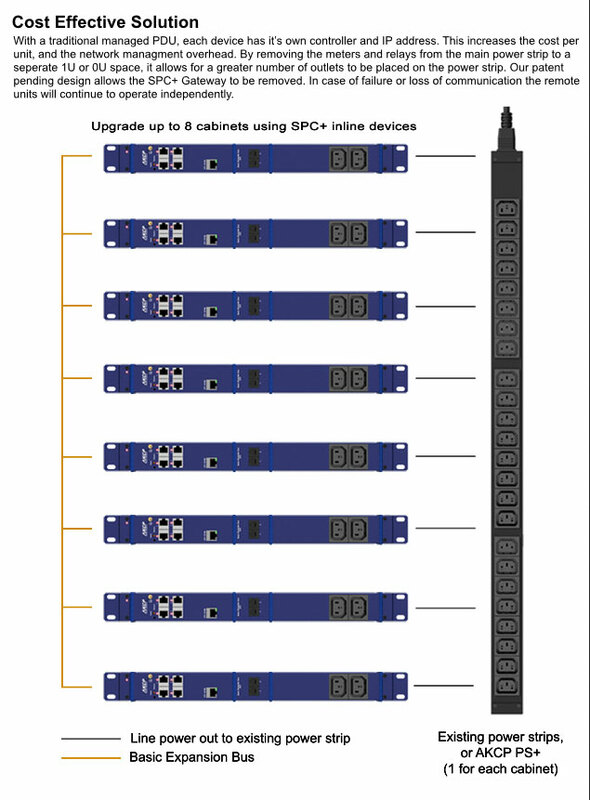 With Basic Expansion Bus up to 8 cabinets can be monitored from a single IP address. This lowers the installation cost for multiple cabinets as the gateway cost is amortized over several cabinets. Our distributed configuration technology means that in that communication is lost between a gateway and remote devices, the remote units continue to function. Power data will remain accurate, fire suppression systems continue to work and boot sequences will still function. 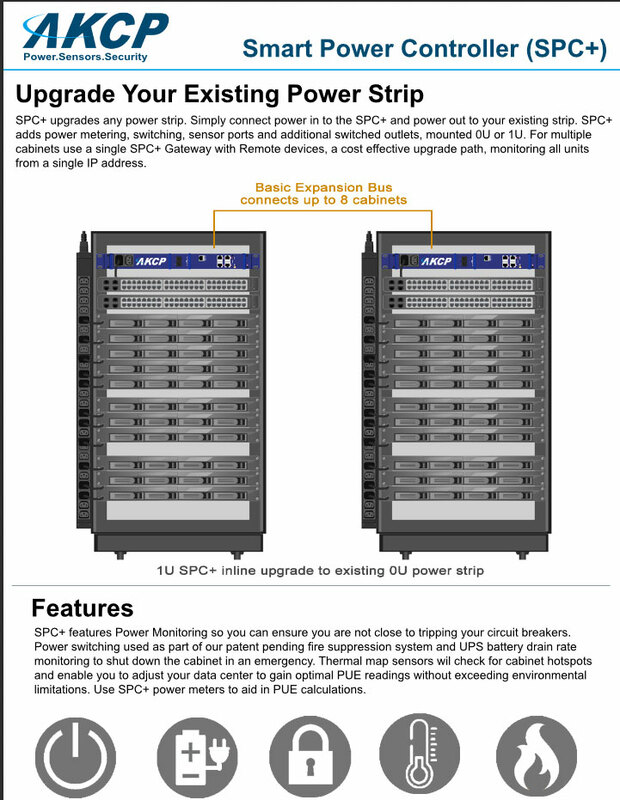 SPC+ comes as a complete kit for upgrading to a smartCabinet system. 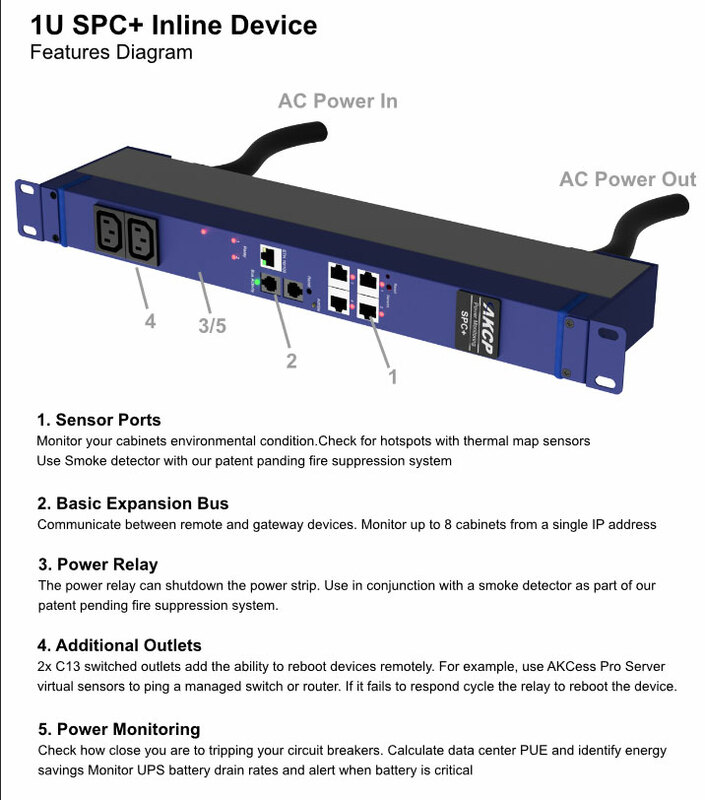 Included with each kit is the SPC+ inline device (1U or 0U) a smoke detector each cabinet, and 1 thermal map for every 4 cabinets as well as our world class AKCess Pro Server central management software. 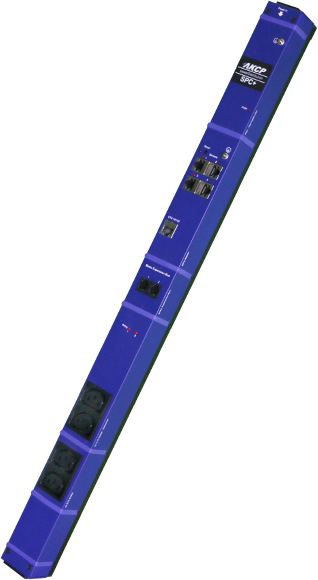 Related links to "AKCP Smart Power Strip (SPC+)"
Mounting 1U 17” rackmount or 0U Universal Tool-less mount. Fixed 1.5m cable with choice of connector (32A). Status Indicators LED – Power on, network connectivity, sensoronline and threshold status, output online and power out put status. Sensors 4x Sensor Ports supports wide range of AKCP intelligent sensors. Power Options Power Meter measures kWh, kW, RMS Current, RMS Voltage, Power Factor, Residual current with billable grade accuracy. Power/Fire Suppression Relay 2x block switched 2xC13 outlets. Customer evaluation for "AKCP Smart Power Strip (SPC+)"